Thinking of visiting Sri Lanka? Think again. Re-launching their #ThinkAgain Ethical Tourism Campaign today, the Sri Lanka Campaign for Peace and Justice have claimed that tourism to Sri Lanka is being used as cover for the military’s takeover of civilian life in Sri Lanka. The launch coincides with the conclusion of TBCAsia, an international Travel bloggers conference, which is taking place in Colombo. The Sri Lanka Campaign’s#ThinkAgain initiative encourages tourists to Sri Lanka to think carefully about the ethical choices involved in their holiday to Sri Lanka – particularly in terms of the risk they face that the money they spend will help line the pockets of alleged war criminals and help contribute to a worsening of the human rights situation It was today re-launched with new information and advice on how to travel to Sri Lanka and a list of 63 hotels, resorts, and attractions to avoid. Fred Carver, Campaign Director for the Sri Lanka Campaign, said; ”Sri Lanka has an appalling human rights record and the recently concluded civil war culminated in some of the worst atrocities of the 21st century. For this reason we do not think anyone should make the decision to visit Sri Lanka lightly. “We are not opposed to people visiting Sri Lanka. Indeed, we think much good can come of such visits and that much harm could result if Sri Lanka is further isolated. Our site will help you understand both the negative and positive impacts of your trip and how, with thought and planning, you can better manage them. 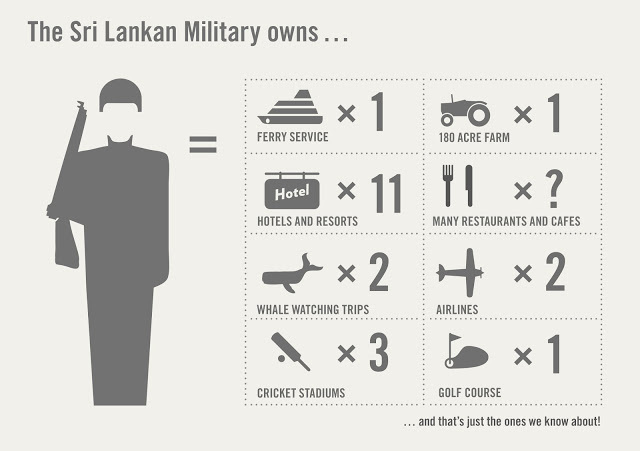 “A large number of hotels and resorts are owned by the Sri Lankan Army. This is part of the Government of Sri Lanka’s attempt to ingrain the military into every aspect of Sri Lankan life, as well as an opportunistic attempt by the armed forces and the regime to profit from their positions of power. In this way the tourism industry in Sri Lanka is being used as a cover for the militarisation of Sri Lanka by stealth. It is important that tourists not contribute to this process.